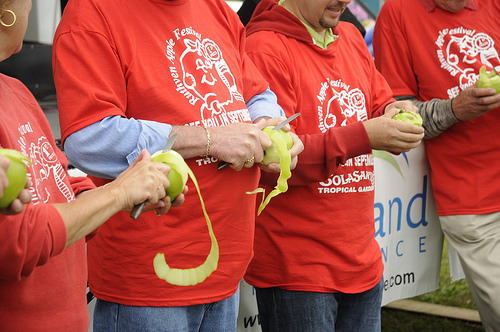 Come celebrate the 40th Anniversary of the Ruthven Apple Festival on Saturday, September 28th and Sunday, September 29th at Colasanti’s Tropical Gardens in Ruthven. This is a great community event for the entire family, filled with fun, food, crafts, entertainment and a classic car show on Sunday. Selected as one of the Top 100 Festivals in Ontario in 2009, 2010 and 2011 by Festival and Events Ontario. The Ruthven Apple Festival has something for everyone! The festival begins early on Saturday morning with a breakfast, featuring country fresh eggs, bacon, toast, peach drink and coffee. Bring the entire family and enjoy two spectacular fun filled days that will include weekend long musical entertainment, inflatables for children, the Apple Festival Car Show (on Sunday, September 29th from 10am to 4pm), over 100 craft and food vendors and the popular Farmers Market filled with all the bounty of Essex County. Thanks to the support of the local community, the festival has raised over $910,000 to date for Community Living Essex County in support of people with an intellectual disability. Proceeds generated go towards the purchase and maintenance of wheel chair accessible vans so everyone has the opportunity to fully enjoy their community.